There is, thankfully, no dramatic resetting of The Wars of the Roses in some other generation – it is the spoken lines themselves that have been altered to incorporate four dramas into three. There’s sword fighting within the first few minutes of Henry VI; some eleven hours later into this trilogy the clashing of metal against metal still goes on. 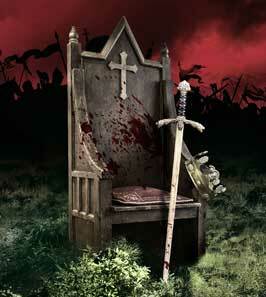 Quite a few characters meet their bloody end; it is, after all, wars – plural – being re-enacted. Some of the cast are ‘slain’ as one character, come back some time later as some other duke, earl or commoner, and are more often than not slain again. It is only (as far as I can deduce) Joely Richardson’s Margaret that is constant, and her statement to the Duchess of York after the final interval summarises the situation well: “I had an Edward, till a Richard killed him. I had a Harry, till a Richard killed him. Thou hadst an Edward, till a Richard killed him. Thou hadst a Richard, till a Richard killed him.” It is important, therefore, to see all three parts of the trilogy, that is, if you want to properly grasp what Margaret means here. Suffice to say there are indeed namesakes galore. Having read through Shakespeare’s Henry VI Parts 1, 2 and 3, I am grateful for John Barton and Peter Hall’s sometimes ruthless cuts from the original text. Sometimes adaptations cut away too much, but I hardly felt cheated by the end of this one. Barton and Hall have left in many of the big set speeches and soliloquies beloved by lovers of the Bard’s plays, but there is a step change in Richard III, which seemed to have many more lines lifted directly from the Shakespeare text than the two plays before it. The language becomes more archaic, and more majestic, and with it, more references to classical Greco-Roman literature and the New Testament. Not even Trevor Nunn could take organised religion out of The Wars of the Roses. The greatest character development of all is seen in Henry VI (a hugely likeable Alex Waldmann) – the audience sees him grow into his role as ruler of the realm. There is much sympathy for Henry as he deals with affairs of state. Even as an unsure and frightened boy with a sceptre in hand, Waldmann held the audience’s attention, and he was conspicuous by his absence whenever off-stage. As for the stage itself, it makes good use of a balcony, as Shakespeare would have done in his day: the best view is thus from the circle, as there is much neck craning involved from the stalls. The set relies on lighting far more than pieces of scenery to set time and place, allowing for very quick scene changes, helping the many hours of the trilogy to pass by quicker than I would have expected. This relentless drive extends even to scenes immediately following intervals – it was a point of amusement for me when the lights went down and dialogue began at once, forcing conversations between members of the audience to cease abruptly, mid-sentence. I am not familiar with Game of Thrones but according to more than one member of the audience, this trilogy is comparable. It is, certainly, an emotional rollercoaster for the audience. As the wars proceed, the fallen are periodically remembered. The deaths are individual (as opposed, for instance, to the actual Battle of Bosworth Field, in which it is believed more than 1,000 lives were lost). There are two ways to look at this. One is to say simply that recreating battles on stage is going to have limitations, however sizeable the cast is – and this one, flanked by a 15-strong ‘Community Chorus’, is large. The other is that in treating each death as a separate event, we see again and again the brutality of war and its consequent impact on the mourners left behind. Different people will take different things away from this production. Those who like action get plenty of it – Malcolm Ranson is not listed as choreographer but as Fight Director, and he’s done a wonderful job here. Robert Sheehan is a revelation as Richard III. From a likeable Duke of Gloucester to a tyrannical dictator as King, Sheehan’s portrayal is both amusing and terrifying. It is rare for so many in an audience to openly gasp as one, but they do so at one stage as Richard speaks his true mind. There are some impressive performances, too, from the likes of Michael Xavier and Alexander Hanson – I daresay their abilities to sing and project over the sound of orchestras as they have done in miscellaneous musical productions over the years has stood them in good stead. Rufus Hound’s Jack Cade was a welcome blast of working class fury in a world inhabited by knights and princes: comic relief, if you will. I must pay tribute to members of the paying public who stayed the course. Half the difficulty for anyone thinking of seeing all three parts in a single day is removed – there are others who have already done it. It is exhausting, and more than a tad repetitive – every time the King enters (whichever King it is) the palace there is a majestic trumpet call, and always the same one. Did the Houses of York and Lancaster really have the exact same fanfare? The marathon of shows is, however, intensely gripping, and the stiffness and discomfort from being sat down in a theatre for so long is more than outweighed by the powerful performances witnessed. Another thing: it may be tiring for us, but do spare a thought for the company. We have become a little too used to seeing fake blood on stage. With the sheer amount of villainy and treachery going on, we mercifully only see blood red when the text demands it. In truth, my lords and ladies (after a whole day of Shakespeare, you really do end up talking like that), this production is a shining demonstration of British theatre at its most refined. Even if the historical accuracy of events as presented in The Wars of the Roses is debatable, this box set of shows is a truly remarkable achievement. A gripping trilogy depicting a saga of violence and intrigue. Cast includes: Joely Richardson, Robert Sheehan, Kåre Conradi, Alex Waldmann & Rufus Hound. Epic, enthralling, extraordinary. This autumn the Rose stage will be transformed into a battleground for The Wars of the Roses, a gripping distillation of four of Shakespeare’s history plays, directed by Trevor Nunn, one of the world’s leading Shakespearean directors. I really enjoyed your review and I’m glad that you’ve also given it a 5 star rating. I work for Sheengate Publishing and my review is due to be published any minute. I though that Joan of Arc gave a brilliant performance and I’ve included some information surrounding the myth and legend built up around her character. Fascinating stuff! I also felt that this was true Shakespeare and it was good to see that Trevor Nunn hadn’t made any attempt to modernise it with modern day costume etc. I opted to see just Henry VI and Edward IV and felt quite exhausted after watching both performances.